Enjoy your own private pool an hot tub while staying at this beautiful Pueblo style home located in the gorgeous Chapel area os Sedona AZ! This home can comfortably sleep up to 8 people but can accommodate 10 (please inquire). Has everything you need for family and friend entertainment. 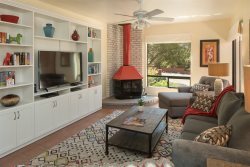 Kick up your feet in front of the large new 70" TV, play a game of billiards or relax in the hot tub! The master bedroom floor has 2 private decks to take in all the Red Rock beauty! Very helpful, quick response and very nice. Had a great time with my family for my birthday.